As a guest in people’s homes, I typically try to contribute to the home in some way as a special thank you. Sometimes my host/hostess knows. Other times they have no idea unless they notice the difference later on. These little thank-you projects are beyond the basics of bringing food or a gift for my hosts. Oct 23, 2017: I interupt my own post to share another person’s post with you. The fabulous traveler/guest/hostess/writer Esther Snippe wrote this perfect advice: “Travel 101: How to be a great guest” and if you’re looking to stay with people, it’s the best advice! When I was 21, staying between two friends’ apartments in NYC before I found my own, I came up with a way to thank my friends. I scrubbed their showers and changed light bulbs one friend couldn’t. This silly thank you became my M-O. At the very least, I clean light switches, door handles, the tops of picture frames doors and doorways, and doors or cupboards where hands leave marks. Sometimes I clean a part of a freezer or refrigerator. I also deep clean kitchen sinks but never add a scratch. I don’t clean because people’s homes are dirty. I do it just to make their lives a bit easier. After all, they made my life greater by inviting me into their homes to experience their towns, cities, countries. The DSL wasn’t working at V’s house. The repairman came out and fixed it from the outside. But then touching the phone cable indoors broke the connection. I replaced the wall jack and the phone line cable, restoring the service. 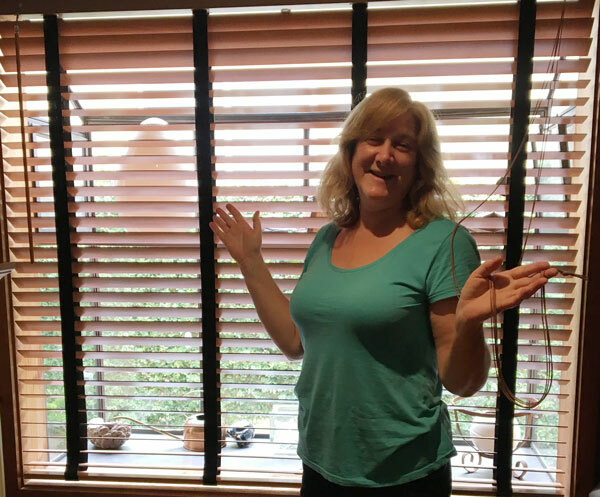 I repaired 2″ wooden blinds on a large picture window and a smaller window. One required complete restringing so they could be raised and lowered. The smaller one other required replacing one of the drums that enabled the blinds to open and close. We purchased the string and drum from FixMyBlinds.com. They also provide excellent how-to info. To restring, I burned the new string to the old. As I had to do this many times, I had three burned fingertips for a while but they healed soon enough. The drum required for the smaller blinds was no longer available so I purchased one that fit inside and then very carefully and slowly did some trick drilling to make it work. It was too tricky to catch a photo of. This project is quite a bit more than normal. I spent a lot of time in this apartment. This shower/bathtub bugged me. The white caulking looked awful and ruined the lines of the great gray marble. I also disliked the darkness coming from within. It’s a rental unit and my hostess didn’t notice it, but I couldn’t resist brightening this up. What lay beneath the white caulking. I peeled the caulking off. 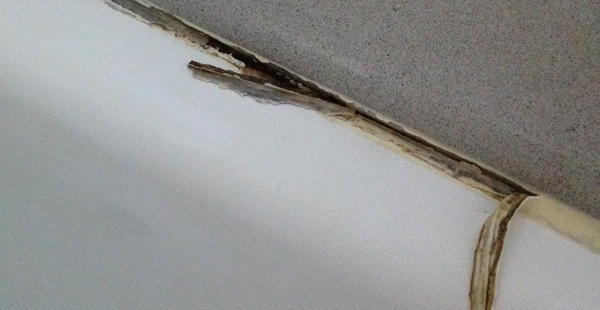 The material beneath was worse than I’d imagined and the lines of the tub were much nicer without that ugly stuff. It was rewarding and exciting to see that caulking go! I cleaned out what was under it and bleached it. I’d also used a bleach and baking soda mix on all tiles. The result of my work – a home nicer for me having been there. After giving it time to dry, I carefully applied clear silicon. Actually, I put silicon everywhere the tile meets the tub. And it’s all perfectly smooth as well so dirt dust won’t accumulate. 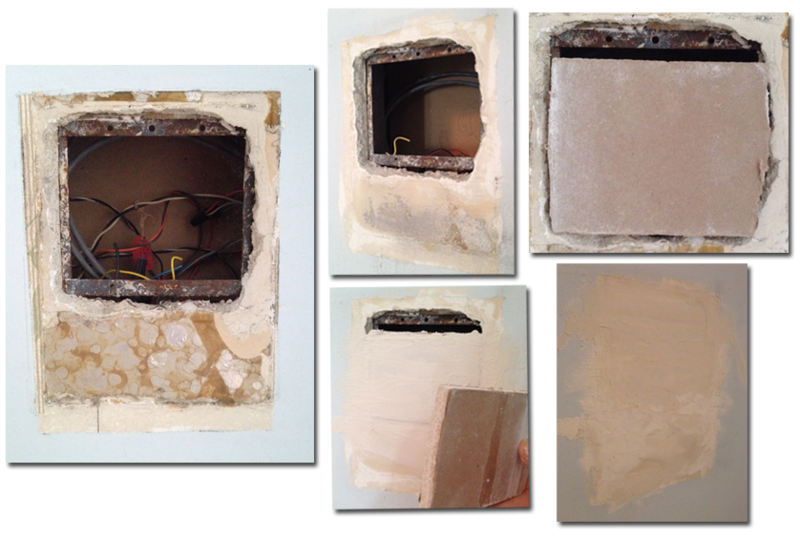 At another home, I became aware that the hallway mirror was there to cover a hole left by the removal of an intercom. This required a trip to the home repair center for sandpaper, some scrap sheet board (wallboard) and a box of power Joint Compound that you mix with water to create the plaster. I don’t have a photo of the final result, but I sanded it to smooth, seamless perfection. Here’s another project: 1960s tiles on a kitchen counter. My hostess was about to try renting out her condo so there was grout to be patched. The best way to patch is to clean the old stuff first so the new grout will match. That’s where I came in. 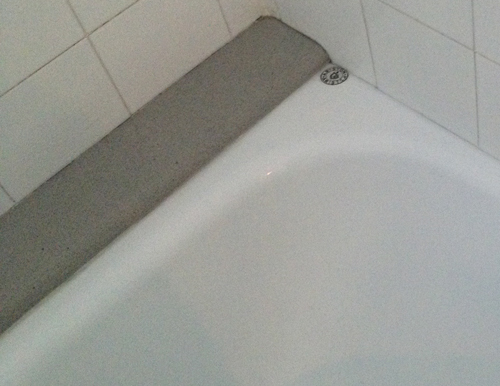 I returned this tile to fresh, clean white — without adding scratches that make them dirtier in the long-run. At one home I washed all of the entry-way, kitchen and hallway walls. At another, I cleaned the well-dirtied kitchen cabinet doors, removing about 20 years of yellowing grime from the kitchen floor. After scrubbing the shower walls, first. I have also rewired electrical outlets or lamps. I have rewired telephone wires outlets. I have cleaned up computers. I have written business materials. I have driven my hosts to or from the airport several times. I have taught my award-winning chocolate chip cookie recipe. I’ ve taken care of a rabbit. I have put together furniture. I have cleaned all the nooks inside of refrigerators. I have sanded furniture to smooth edges. Once was at a hostel, where the bunk’s metal frame as it was cutting guests. I used my metal nail file to smooth out the stray metal. I have also gone into a local supermarket and bought or arranged a gift card to cover food — even when the market didn’t really have gift cards. no wonder you’re welcome in many people’s homes! love it! Your restringing the blinds story is awesome. You rock! !